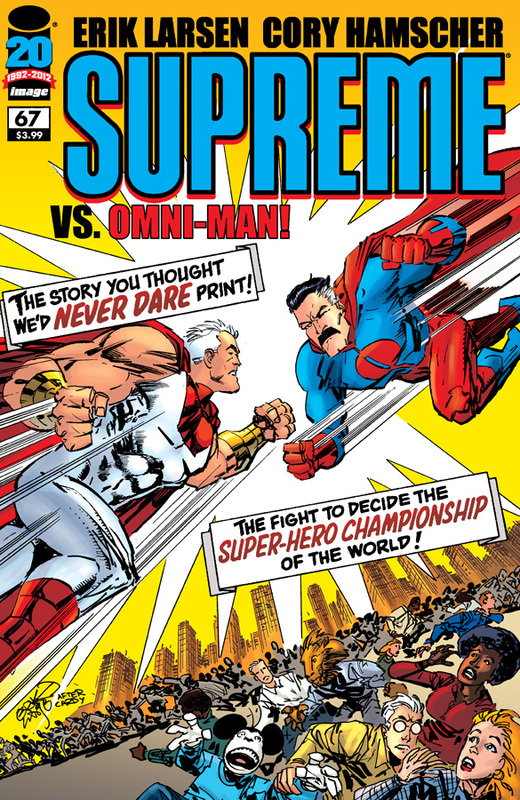 The Fellowship was fortunate enough to obtain a copy of SUPREME #67 from Image Comics. The story is by Erik Larsen with art by Larsen and Cory Hamscher and colors by Steve Oliff. Omni-Man (from the series INVINCIBLE) shows up and tries to stop the destructive ways of the recently released Mega Supreme. Meanwhile, the depowered Supremes from other dimensions rescue Suprema who is barely alive after the beating she received from Supreme. They must find a way to regain their powers and stop him, but how far will they go to do it? Are they so desperate that they with make a deal with the devil? I like how Erik Larsen has maintained a balance between Alan Moore’s silver age version and the original Rob Liefield’s modern version. I’ve been more of a fan of the silver age, but the reintroduction of the Liefield (now known as “mean”) Supreme and what he has done has been intriguing. As I have said before I like Larsen’s art. He’s very much in the style of Walt Simonson and Jack Kirby – two of my favorites. This book has the heart of the Silver Age with a touch of its goofiness, but also has a darker tone that those books would never touch. SUPREME has something that should appeal to anyone. SUPREME #67 is in stores now and available at www.imagecomics.com.